Christmas Bookish Gift Guide with Exclusive Discounts! My Christmas Bookish Gift Guide has become an annual tradition, and it’s a post I look forward to every year. I love Christmas, I love books and bookish merch, and I love shopping. So, honestly? I’m in blog post heaven. Warning! This Gift Guide includes Exclusive Discount Codes for Confessions of a Book Geek readers! Get 10% off when you buy any 2 or more books with discount code BOOKGEEK10! Discount code expires 31st December 2017. Click here to browse. This discount code applies across the WHOLE website. So if you’re wanting to treat yo’shelf to a winter read, or if you’re planning on buying some books for loved ones, now is the time! 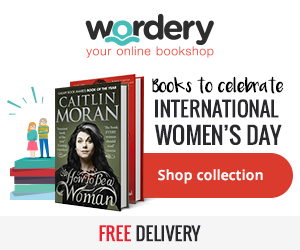 Wordery have over 10 million books available for free delivery to over 100 countries. As well as books, they also sell tote bags, notebooks, bookmarks, and more. Prices start at £11.65 BUT discount code BOOKGEEK gets you 10% off any order. Discount Code expires 26th December 2017. Click here to be taken to the store. Gorgeous handmade candles from our very own Book Blogger, Brittany @ The Book Addict’s Guide! I’m sure many of these names are recognisable to Book Geeks, and they’re in such cute jars! Prices start at £5.00 BUT discount code MINDTHEGEEK gets you FREE INT SHIPPING! Discount code expires 31st January 2018. Click here to be taken to the store. I absolutely love the cute and quirky originality of these pieces, for something a little different that’s always unique, and never ordinary! I own one of the pieces and can vouch for their quality! Prices start at £1.30 BUT discount code BOOKGEEK gets you 15% off any order! Orders over $10 also get a free random bookmark. Discount code excludes shipping, and expires 31st December 2016. Click here to be taken to the store. These are stunning! I bought some for myself last year, as well as some as gifts for my book blogging friends. They are beautifully illustrated, and very reasonably priced, what’s not to love?! Prices start at £3.00 BUT the discount code BOOKGEEK17 gets you 15% off! There are some great quote pendants, nostalgic characters, and simple charm necklaces in this store, and with prices starting from just £2.00, you could treat yourself to more than one! Prices start at £2.48 BUT discount code READON gets you 20% off any order! Book Fiend have brilliant aluminium bookmarks and humorous bumper stickers (that I’m sure can be used on many different surfaces), as well as beautifully engraved necklaces and bracelets. Well worth a look! Prices start at £6.34 BUT discount code BOOKGEEK17 gets you 15% off any two items! Discount code expires 7th January 2018. Click here to be taken to the store. There is SUCH a wide range of book covers available, you’re sure to find something to suit all kinds of Book Geeks, and they’re printed on vintage paper! Prices start at £32.13 BUT discount code BOOKGEEK gets you 15% off! Prices start at £10.51 BUT discount code Crazygift gets you 20% off! Discount code expires 31st December 2017. Click here to be taken to the store. Prices start at £1.60 BUT discount code XMAS20 gets you 20% off any order! Discount code expires 10th January 2018. Click here to be taken to the store. Jazz up your planners and journals with well-known character stickers, and stickers Book Geeks will find particularly useful. The new bookmarks are also delish! Prices start at £2.10 BUT discount code CBG20 gets you 20% off any order! Discount code expires 31st January 2017. Click here to be taken to the store. Prices start at £14.00 BUT discount code WINTER17 gets you 10% off any order! Prices start at £11.87 BUT discount code BOOKGEEK15 gets you 15% off (non-sale items)! Us Book Geeks love nothing more than wearing our passions, and these tees give a nod to some of our all time favourites. Prices start at £3.50 BUT discount code Bookish16 gets you 5% off any order! *If you, or someone you know, would like to take part in this Gift Guide, contact me so your store can be added. Love the literary shirts, as well candles. Hoping to get any of those this Christmas! I look forward to this post every year. I really do. I am using the Wordery discount code as a book buying excuse and no one can stop me (I may buy a couple of folks book gifts as well). And those candles from Novelly Yours! I am all over this. Thanks for the discounts and an excellent excuse to spend some money!